Since its official inauguration in 1926, the course at Bovey Castle has been consistently regarded as one of the best inland challenges in the South West and beyond. The course is set within the beautiful parkland of the Dartmoor National Park, and was originally conceived by the revered J.F. Abercromby as a sister course to the world-renowned Gleneagles and Turnberry, but has since been revised by designers Donald Steel and Tom Mackenzie. 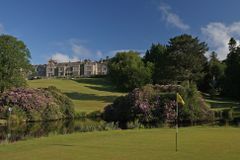 Although it has always been a course of considerable repute, Bovey Castle has greatly benefited from recent investment to improve both its condition and appearance; the drainage and irrigation systems have been completely overhauled, new tee boxes added and many of the bunkers and greens have been reworked. The resultant 6,303 yard championship layout befits the grandeur of the estate, and is a real gem of a course. Against the backdrop of the Bovey and Bowden rivers, which golfers must negotiate frequently, Bovey Castle has been restored to its former glory and is among England's most luxurious destinations for a golf break. A stay at Bovey Castle is a unique experience of true British luxury within the setting of Devon’s ancient moorlands. From the tailored tweed plus-two trousers worn by the hotel concierge to the apples and sloes gathered from the grounds to make traditional cider and gin, Bovey Castle draws its contemporary and luxurious appeal from the manor house’s rich heritage as a private home and 275-acre country estate. Bovey Castle is a throwback to the grandiose extravagance of the 1920s with the charm and opulence of that time being retained through striking period furnishings and decoration. The accommodation is divided into 60 bedrooms in the original manor house and mews building, with 22 three-storey granite lodges hidden within the estate for couples and families seeking additional privacy. The Elan Spa at Bovey Castle is a sanctuary tucked away from the bustle of modern life. Echoing the tranquillity and therapeutic flow of the River Bovey, our bespoke spa experiences using ESPA products have been created to relax, revive and restore the body and spirit. Our dedicated team of therapists together hold a wealth of knowledge and experience encouraging a respect and understanding of the body that is both rare and valuable. Housed in the Orangery, the hotel’s Art Deco inspired swimming pool overlooks the sun terrace and the River Bovey, offering stunning views for miles over Dartmoor. Bovey Castle’s Elan spa facilities also include a Jacuzzi, sauna and steam room. The hotel gym is stocked with a full range of Precor, cardiovascular and strength equipment. The dining experiences at Bovey Castle have been designed to complement the hotel's reputation for country house elegance and outdoor activities. The hotel’s main restaurant, The Great Western,. Restaurant is relaxed and comfortable, yet upscale and classy (a supplement would apply). We call it ‘exclusive dining’ actually, purely because it’s an experience you won’t find anywhere else, whilst Smith’s Brasserie offers a relaxed atmosphere serving up classic British classics. Whether you plan to participate in one or two of the hotel's impressive guest activities or retreat to the tranquillity of the Adam Room's plush armchairs, the style and selection found in each of the hotel's restaurants and dining areas cater for all tastes. Visitors to Bovey Castle will be astounded by the undiluted quality of the hotel and its magical surroundings, where a luxury golf or leisure escape is guaranteed.